Let's take a look at what it takes to write a simple "Hello, world!" GUI program for my operating system. First, we need to write a manifest file. All we need to do is declare the properties for our main window, and how to build the program. Then, we write the program itself. // Include the API header. // Include the automatically-generated manifest header. 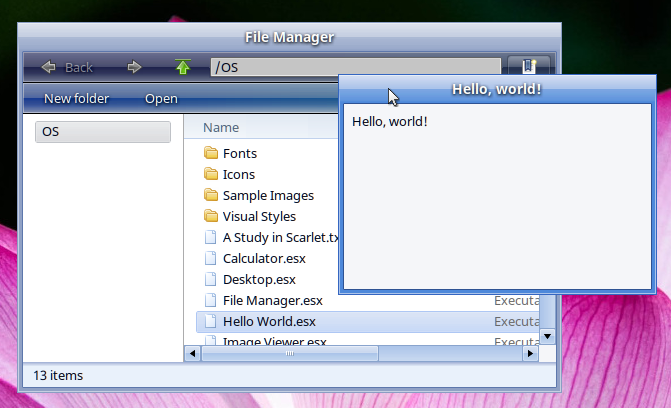 // Create a window using the mainWindow template from the manifest. // Create a container grid, and make it the window's root grid. // Create a label, and add it to the grid. // Finally, process messages from the window manager until the program exits. Finally, we add a line to compi‌le‌.‌‌s‌h to build the program. ...and we have a program! Why did you choose to use manifests files ? I know there is probably more to it then what you shown, but what's in it could be passed to the compiler as command line parameters. And the title of the window is probably something I would like to set in the code. I only used manifest files on Android and it never seemed like a good idea to me. But I only did two small "things" so my opinion is not really informed. The manifest files were mostly born out of my desire to have a notion of "commands". I want the user to be able to configure the keyboard shortcuts for these, put them into custom menus, use them for automation, and so on, without the program really having to worry about how. Therefore they are statically declared in manifest files. Is the manifest file only used to generate C code, or is it use by the OS after the building the program ? Currently the manifest file is only used during building, but it will be used by the OS when I implement the features that need it.